Local Weather | Have More Fun. Get Boativated! The “cruising season” in the Pacific Northwest generally runs from mid-June to mid-September. This varies from year to year depending upon the spring and fall weather. There are days in May when boating is fabulous, with high temperatures in the 60’s and lows in the 40’s. There are days in late September that are similar. 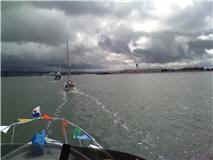 However, cruisers need to pay attention to the weather forecasts and consult the VHF daily. It really helps to have internet access or other sources of weather information and the ability to get accurate forecasts for several days ahead. Pacific storms (usually mild but storms nevertheless) can roll in quickly and change the weather from moderate to ugly in very short order. The upside of unstable weather in the “shoulder seasons” is that crowds are substantially diminished to non-existent. Favorite parks and anchorages may be nearly empty, especially on weekdays during May (before Memorial Day) and in September (after Labor Day). However, nights can be chilly and cabin heat is necessary for comfort. Here’s a cool La Nina day in May. During the summer months light clothing and the ability to “layer” is sufficient most of the time. In the spring and fall we find that heavier and warmer clothing is essential, especially for sailing. We often wear flannel lined jeans or polar tech lined jeans, a warm, long sleeved wool shirt with a long sleeved T-shirt under-neath, combined with a light down-vest, a polar-tech lined waterproof jacket, and a goretex hat with an inner liner. There are many sources of weather information, including AM and FM radio, satellite radio, and official weather reports on the VHF. The official NOAA weather reports on VHF tend to be short term, with predictions only going forward by 24 hours. Longer term forecasts are short summaries of expected conditions. In British Columbia the same is true. However, the VHF weather information includes buoy and lighthouse weather conditions, with wind speeds and wave heights. This can be very useful information for calculating conditions where you may be headed or for determining your next destination. We always listen to the VHF weather predictions, the synopsis weather statements, and the reports of current conditions before we choose an anchorage. Knowing that the wind may blow 15 – 25 knots from the SE at night will determine our choice of anchorage and our location in an anchorage and keep us comfortable and asleep even though the wind may be howling in the trees above. Seasonal weather in the Pacific Northwest is heavily dependent upon ocean currents and temperatures. There are two Pacific Ocean weather phenomena (El Nino and La Nina) that substantially affect local marine weather. For example, the winter and spring of 2011 is a “La Nina” year. This means cool or cold water in the Pacific Ocean off the west coast of the U.S. and Canada. This cool water is partially responsible for the tumultuous tornadoes in the U.S. mid-west and south in April, 2011. The cool water also affects the formation, strength, and stability of the “Pacific High” that forms off the central and north coast of British Columbia in the summer. When the Pacific High forms, strengthens, and stays put in the summer the south coast of British Columbia and Washington State waters can experience warm, dry summers with temperatures in the 80’s and even 90’s, with light winds and warm nights. However, in La Nina conditions it is not unusual to have wet and cool weather into late June or even into July and the real summer weather may only last 6 weeks or so in late July and through August. For more information about La Nina sand El Nino weather conditions visit NOAA: What is El Nino? For information about La Nina visit the NOAA: What is La Nina?.. The following links are sources that we use to keep track of the weather whenever we cruise.